Congressional Democrats stood with port truck drivers and labor representatives while revealing two bills aimed at addressing pollution and working conditions at the nation’s ports Thursday. Screenshot of Facebook Live video posted by Good Jobs Nation. In an early morning press conference at the nation’s capital on Thursday Democratic lawmakers introduced two bills aimed at curbing employment abuse of the nation’s port truck drivers as well as curbing pollution levels. 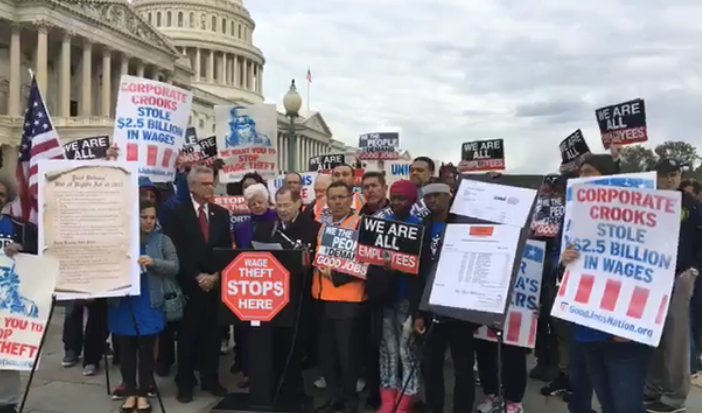 United States House of Representatives Grace Napolitano (CA) and Jerrold Nadler (NY) stood with drivers from ports around the country including the complex shared by Los Angeles and Long Beach to introduce the legislation. Nadler’s “Clean Ports Act of 2017” seeks to curb emissions that affect drivers and those communities adjacent to the nation’s port complexes while Napolitano’s “Port Driver’s Bill of Rights Act of 2017” aims to end wage theft of port drivers by establishing a task force to investigate and police bad actors. If the truck driver bill of rights can gain bipartisan support it could ban exploitative lease-to-own models and block companies from classifying workers as independent contractors while guaranteeing them basic state and federal labor protections. Both were constant themes during Long Beach elected leaders’ deliberations on minimum wage policies but no action has been taken to address those conditions at the port. Lowenthal praised the ports of Long Beach and Los Angeles for taking “historic” steps to curb pollution through their Clean Air Action Plan (CAAP)—the ports are in the process of updating that document with a finalized version scheduled for a possible vote November 2—but said that the reductions in emissions that have resulted have also come at a cost to workers. The clean truck program adopted in the 2007 CAAP has resulted in dramatic decreases in port pollution caused by the trucks that transport goods to and from the docks, but it also introduced what Lowenthal characterized as “punitive” leasing programs where drivers in some cases are forced to pay for the trucks they use to work, often resulting in little to no earnings after logging a full week’s worth of hours. He said the bills were common sense. In the 2017 CAAP, the port complexes are pushing for even cleaner vehicle standards with a goal of zero emission trucks by 2035. A yet-to-be-determined fine schedule will be imposed on companies who are non-compliant with the outlined goals for near-zero and zero-emissions. The costs to upgrade trucks that are still within their lifespan and the fees for not replacing them within the allotted timelines are again feared to be poised to be passed onto drivers. In a revised version of the CAAP released this week, some language has been added to protect drivers and the port complexes will look into funding sources that can help offset the purchase of new vehicles. Fred Potter, vice president of Teamsters International, said that not enough has been done to protect drivers up to this point. Potter was on hand at a series of strikes at the Los Angeles and Long Beach ports in June where drivers blocked entry ways into shipping yards as they demanded to be classified as employees and called for an end to wage theft. The strikes came on the heels of an investigative report released by USA Today detailing how truck companies at California ports and beyond have skirted employee labor laws and drained workers of their earnings by making them pay to drive the trucks they need to work. It revealed that court decisions totaling over $40 million in backpay for drivers have been awarded by the California Labor Commissioner alone. Thursday, USA Today released part three of that series detailing the lengths to which companies have gone to avoid paying employees hundreds of thousands of dollars in settlements in some cases when they are found to have committed wage theft. Daniel Aneseko “Seko” Uaina, a Long Beach driver who works for Intermodal Bridge Transport, said that justice needs to be served and that the nation’s port truck drivers cannot bear the burden for truck companies any longer. In an interview with the Post in June, Seko said that an estimated $1,200 a month is deducted from his pay for the “lease-to-own” model that he’s under contract with. He’s lost any hope of ever owning the truck that he pays to drive everyday.